BAseball Reality Tour: What's Up with Mike Scott? What's Up with Mike Scott? Surely, there are others who woke up this Thanksgiving morning and started looking at pitching stats from 1982. I'm starting a pitching project from 1982-present, and thought I'd share some early morning musings. Thirty years ago, Pete Vuckovich won the American League Cy Young Award, with a sparkling 18-6 record. He started 30 games, with 9 complete games and a shutout. The player who probably should have won that year, Toronto's Dave Stieb, went 17-14, but his WAR was almost three times as high as Vuckovich's (7.3 to 2.5). Stieb had a slightly lower ERA, but an ERA+ that's 24 points higher, while starting 8 more games and throwing 65 more innings. The Toronto ace also threw 19 complete games and 5 shutouts. We can see how important a pitcher's Win-Loss record was back then, when noticing that Vuckovich only struck out 105 batters, and he walked 102. BBWAA awards voters didn't have WAR or ERA+ to consider, when voting in 1982. They did have walks, strikeouts, complete games, shutouts, etc. They just didn't care about much beyond "18-6 is better than 17-14." The 1982 Cincinnati Reds had a rough season, with a 61-101 record matching that of the abominable 2012 Cubs. At least, they had some interesting starting pitching. This was the last year in Cincinnati for 37-year old Tom Seaver, after a 5-13 record and 5.50 ERA. Seaver would go on to give the Mets one more year in 1983, before finishing his career in the American League, wearing White and Red Sox. At the top of the Reds rotation, a couple of hard luck starters stand out. Mario Soto went 14-13, with a 2.79 ERA and 274 strikeouts. Bruce Berenyi had a league-worst 18 losses, but also a league best 0.3 HR/9. Soto and Berenyi were in the Top 8 in the National League in Wins Above Replacement, and the Reds still lost 101 games. The Reds lost 23 games that Bruce Berenyi started, the most in all of baseball. The worst winning percentage a team had behind any qualified starter in 1982 belonged to the New York Mets, who went 6-16 in games started by Mike Scott. Again, this was early this morning. 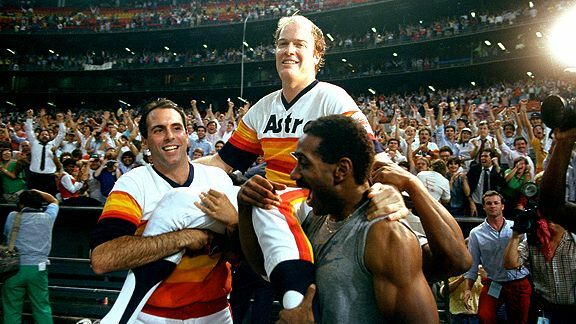 I rubbed my eyes and thought, "is that the Mike Scott - the '86 NLCS MVP from the Astros?" Of course it was. What a remarkable turn of his career. What happened? Before, Mike Scott's age-30 season (1985), Roger Craig taught him the split-finger fastball.